Let's face it...healthy chicken dinners can be boring. Unless you enjoy eating the same thing every day, taking those holiday pounds off can get really challenging, really quickly. Going dairy-free is another way to get healthy and get the holiday pounds off. It's easier than ever with help from www.godairyfree.org and products from So Delicious. They've teamed up for a great 3-course recipe contest and this is one of my main course entries! 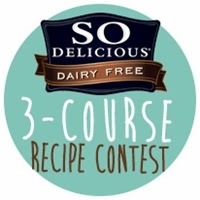 Go to the recipe contest page! 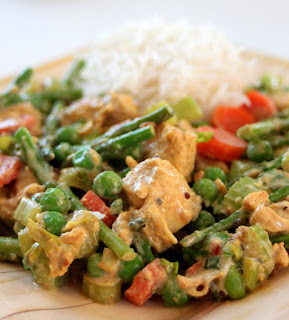 Exotic spices and ethnic dishes are often a great alternative that don't add too many calories. 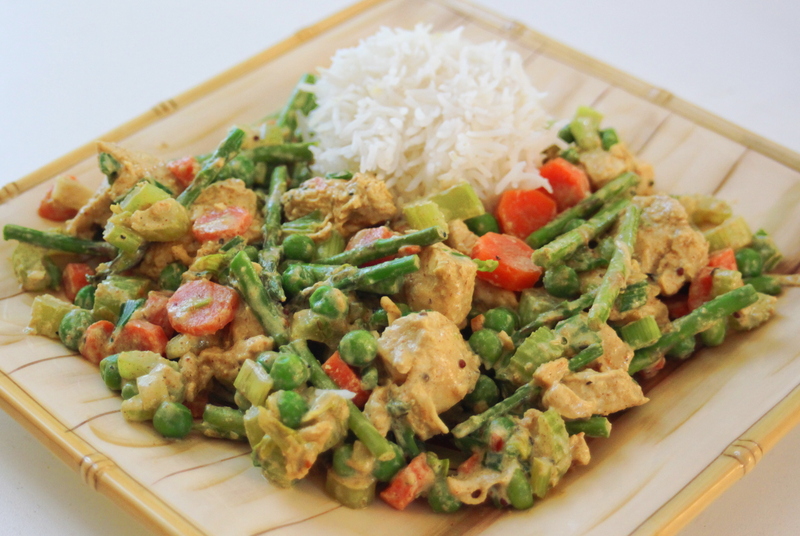 So today, we're doing a delicious Indian chicken curry where we used just a bit of Dairy-Free Greek Style Cultured Coconut Milk from So Delicious for our creamy, saucy texture. The Jamaican jerk seasoning adds just the right amount of heat, and it's a really easy way to make a unique and flavorful curry mixture. Heat a wok or large skillet to high heat and coat with olive oil cooking spray. Add the chicken, jerk seasoning, garlic powder and curry powder. Season with salt and pepper to taste. Stir until combined and cook for 2-3 minutes. Add carrots and celery, cook for about 4 minutes, stirring frequently, until chicken is just cooked through. Stir in scallions, asparagus and peas. Turn off heat, stir in the Greek style coconut milk and just a bit of water to deglaze the bottom of the pan. Adjust seasoning (if desired) and stir until all ingredients are coated with the coconut curry sauce. Cover and allow the veggies to steam for about 2-3 minutes before serving. Serve with basmati or jasmine rice.